Play Days This Fall - Join In! Tennis events for young kids are coming to an area near you. We are encouraging facilities to host Tennis Play Day events for parents and children between September 1 and October 6 as part of a joint partnership with the Nickelodeon Network to promote healthy, active lifestyles for children. The widely viewed kids' television station is blacking out its coverage for the Worldwide Day of Play on Saturday, September 24 for a few hours even in an effort to get kids off the couch and out on a field of play, or, in our case...a tennis court! This is a great way to get your child started or interested in the sport and a terrific opportunity to see what local facilities offer tennis-programming wise for kids! 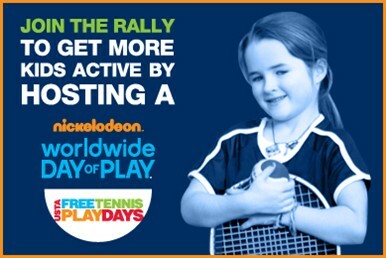 If you're a facility interested in hosting a USTA Free Tennis Play Day in celebration of Nickelodeon's Worldwide Day of Play, register HERE. For parents and kids, take a look at our schedule below or click HERE to see a list of upcoming Play Day events in your area. If you can't find one near you, call your local facility and request one! *Held during Women's USTA Pro Circuit ColemanVision Championships event.